An Abuja Federal High Court on Thursday ordered that the secessionist leader and gave a direction that his trial will proceed in his absence. Nnamdi Kanu is charged for offences relating to treasonable felony while the court also revokes the bail it granted him earlier. In a swift turn of events, the President-General of Ohanaeze Ndigbo Youth Council, Okechukwu Isiguzoro, and Secretary General, Okwu Nnabuike, in a press release on Saturday stated that such action might finally destrabilise the current fragile peace in the Igbo speaking South-East region. The Ohanaeze Ndigbo youths disclosed that the first arrest of the IPOB leader was marred by widespread instability and violence in the region while asking President Muhammadu Buhari to issue presidential pardon to Biafra agitators to show compassion to the igbo nation. “On the matter of revocation of Kanu’s bail and the consequent Order of bench warrant, I, Barrister Aloy Ejimakor, Counsel to one of the sureties and a Special Counsel to Nnamdi Kanu, hereby issue the following this statement. “The reports in the media quoting Justice Binta Murtala-Nyako as stating (when revoking Nnamdi Kanu’s bail on March 28, 2019) that the ‘three sureties who bailed Kanu had applied to the court to withdraw their suretyship’ is inaccurate. 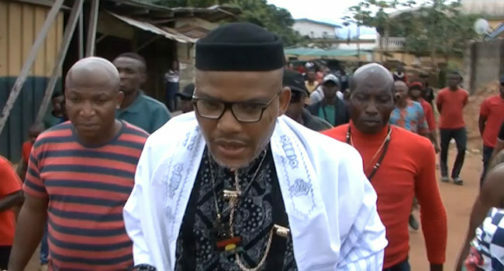 Ejimakor said that on the contrary, the sureties have been fighting to stay on as sureties while pointing to the army’s invasion of Kanu’s home as the sole and proximate reason for their inability to produce Kanu in Court. He said, “That argument is still pending a hearing in a suretyship proceedings that was adjourned sine die at the time of the entry of the Order of bail revocation and the ensuing bench warrant.